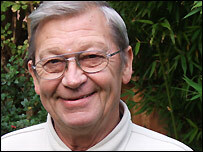 Tom White was the UK's cultural attache in Burma during the 1988 protests and bloody crackdown that ensued. He argues that the ruling junta is heavily influenced by lucky numbers. Burma's ruling junta holds a belief, widely shared by the Burmese public, in astrology as a means of explaining the present and influencing the future. This was apparent in the 1988 pro-democracy uprising and has resurfaced during the current crisis. Ne Win, Burma's dictator from 1962 to 1988, had blind faith in nine as his lucky number, hence the sudden decision in September 1987 to issue banknotes whose face value was divisible by nine (for example 45 and 90 kyat). The democracy movement's favourite number was eight, so the 1988 uprising sparked by the ensuing economic crisis began on 8 August (8/8/88). It was savagely put down by the army on the 18th of the following month (1+8=9) of September - the ninth month. A few nights ago, the BBC rebroadcast a clip from a Burmese television report on what it said was a mass rally supporting the government in the face of the current crisis, attended by "98,100 people" (9 and 8+1). The outside world makes the mistake of assuming that the junta is amenable to negotiation on what we regard as common values: democracy, respect for human rights, protection from the arbitrary exercise of power. This is simply not the case. The junta can only understand the street demonstrations by monks and people as subversion fomented by (unnamed but baleful) "foreign powers". Their perceived duty is to suppress the democracy movement, whatever the cost in human suffering, for the greater good of the nation. In their own eyes, and encouraged by their astrologers, this is a virtuous action. 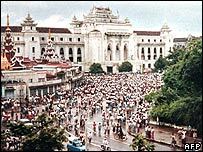 The hardline suppression of the latest protests began on the same date as the 1988 crackdown, with the added bonus of a third nine: 18/9/2007 (2+7= 9). It is unlikely that UN envoy Ibrahim Gambari's programme included consultations with the junta's astrologers, and yet these are the people who hold the key to the leader's strategy. Given the closed mindset of the junta, efforts by China, India, the EU, the UN and Asean (Association of South East Asian Nations) are likely to prove irrelevant. The democratic movement is defenceless in the face of 300,000 soldiers, and its only hope, now as in 1988, is that enough troops might be so sickened by what they have had to do that they are prepared to disobey orders. From personal experience, my wife and I know that in the final stages of the 41-day uprising in 1988, democracy leader Aung San Suu Kyi privately admitted that a split in the army seemed the only remaining hope of overthrowing the dictatorship. She was prepared to negotiate an appropriate role for the armed forces in the running of a democratic state, and was genuine in her willingness to co-operate with the army her father founded in 1941. In a tactically astute move in 1988, she made sure that the co-founders of her National League for Democracy included a senior retired general. Unfortunately, and through no fault of Aung San Suu Kyi, the man - Aung Gyi - proved to be an embarrassment to the movement. 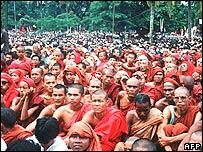 It is natural for the Burmese to see the world through the prism of their Buddhist beliefs. In this context, the Burmese must have seen as little short of miraculous the completely unexpected appearance of a tearful Aung San Suu Kyi at the gates of her house, praying for a few moments with the monks on one of their early democracy marches this month. Heads must have rolled among the military after such a catastrophic lapse in their "security" measures. We know Aung San Suu Kyi normally remains outwardly composed. I was there at the sombre moment in 1989 when she said goodbye to her sons, knowing full well that this meant farewell forever, but even then I only saw a stray tear. But it is impossible to overestimate the symbolic impact those moments in prayer with the monks must have had for Aung San Suu Kyi, and the great boost it would have given to the morale of the democracy marchers. All the embassies in Rangoon have military attaches, and one can only hope that part of their duties include identifying and discreetly supporting dissidents in the Burmese armed forces. Likewise, the world's democracies should mobilise the resources of their intelligence agencies, rather than soothing their consciences by imposing further useless economic sanctions (unless these can be extended to China, India and Asean, when they really would have an effect). The plight of the beleaguered Burmese is a poignant reminder to us all that in Burma, as elsewhere, democracy and the ideals of the open society are on trial.